, all of our North American civilization, even our Western civilization is not only threatened, but will perish with certainty. I did a lot of personal research on the famous giant volcano Yellowstone and I can not help but reflect on the sudden changes observed recently by scientists from the University of Utah. The news is alarming and we are simply reconsider the meaning of our life, our daily habits and our relationship with nature and … the entire cosmos. Currently, all humans living in North America is too busy with work, capitalist greed and equipment and their daily routine to really worry about the dangers that threaten us all …! Numerous studies have established links between solar activity and earthquakes on Earth … or similar eruptions volcaniques.Si the solar maximum of 2012 surprises us by his power, if a major solar storm shakes us with a very very intensive, we will be in trouble. Solar activity when intense, increasing the number and intensity of earthquakes on the planet, eventually producing plates and rearrangements in the evolution of the crust towards the core of the Earth. It is a chain reaction that will undoubtedly awaken many sleeping giants. But what if there is a super volcano, which is already showing signs of activity? 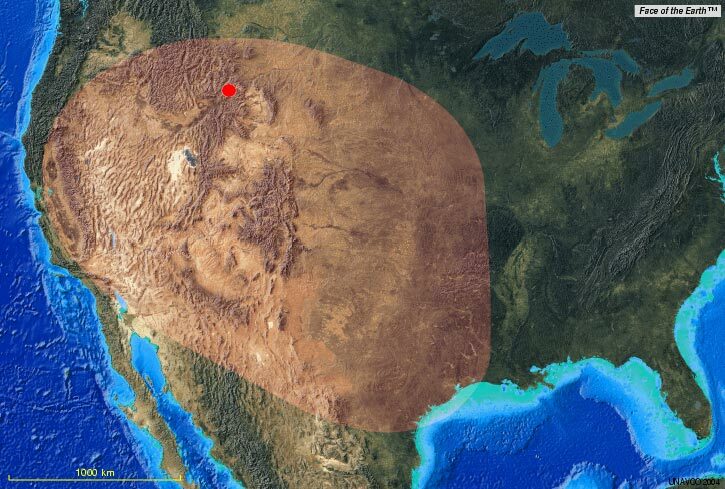 The super volcano near Yellowstone National Park in the western United States shows signs of activity « explosive » that could eliminate up to two thirds of the United States. The ground is inflated by 20 centimeters over the past three years (since 2009), a record.Une supervolcano eruption once activated, two-thirds of the U.S. could become uninhabitable. During the last two weeks (since the beginning of October 2012), more than 100 small earthquakes of moderate intensity per day, on average, have shaken the region of Yellowstone National Park, putting scientists who monitor the park’s geology state of alert. A force a thousand times more powerful than the eruption of Mount St. Helens in 1980, a deadly cloud of ash, erase all living things by creating a layer of 3 meters within 1500 miles. Two thirds of the U.S. could become uninhabitable by simply sweeping winds toxic air, and millions of people were forced to leave their homes. 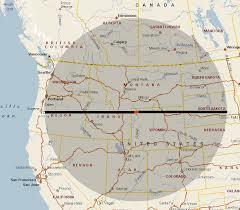 The caldera of Yellowstone National Park erupted three times in the last 2.1 million years. A trend in recent years has alerted the experts who closely follow the evolution of the volcano. The super-volcano underneath the Wyoming park has increased its activity at a record rate since 2004. Its soil inflated at a rate of 7.5 centimeters per year over the past three years, the fastest pace since records began in 1923. In the absence of other data, scientists are reluctant to give a warning and set a date for a hypothetical eruption. An eruption of this volcano would far exceed the effect of the Icelandic volcano Eyjafjallajökull, which erupted in April last year, causing travel chaos around the world. In 2012, with more efficient equipment and budgets, the great reservoir of magma was spotted six kilometers from the surface … and the thickness of the crust is very thin below Yelklowstone Park. We are therefore faced with a sort of countdown to the whims of the cosmos itself. The super-eruption of Toba (Indonesia today) occurred 74,000 years here gave birth to a lake in the caldera measuring 100 km long and 60 km wide. In short, it was a colossal explosion whose ashes were scattered over thousands of miles away. Scientists are only beginning to understand the effects of the release of much volcanic ash in the atmosphere of the planet. If we analyze geological samples found around the world on the ocean floor, and now carefully preserved at the American University of Columbia, you can find out what happened to the days when Toba erupted. today that the size of the eruption of Toba was huge. We are talking about 3000 km3 of material that was ejected from the volcano. This represents approximately 10,000 times the size of the eruption of St. Helens in 1980 is considered one of the largest eruptions to this day. The energy released by the great Toba eruption was equivalent to 1 GT of TNT, or about 67,000 times the Hiroshima bomb. This is a VEI August 10 times more intense than the minimum, producing effects similar to that of an asteroid at least 800 m in diameter on a granitic soil. A 2500 km from Toba retouve on the ocean floor in a layer of ash 35 cm thick which was deposited immediately after the eruption. It reveals that Toba caused a super volcanic event of a power far greater than all other volcanoes known until today. The ash analysis revealed that the eruption was rich in sulfur and have released a huge amount of sulfur dioxide and other gases into the stratosphere, where they are fallen aerosol acid compounds sulfuric affecting the Earth’s climate over the years. 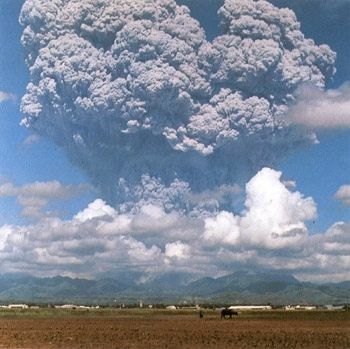 June 12, 1991, eruption of Mount Pinatubo in the Philippines caused a decrease to 0 .5 degree Celsius global scale. Following the eruption of Mount Pinatubo in 1991, we know that the ashes transported to the stratosphere, over 18 km altitude at that latitude, have obscured the sunlight and caused a cooling of the climate scale World. The year after the eruption, we indeed witnessed a drop in average global temperature of 0.5 ° C.
By comparing the amount of material ejected by Pinatubo but also St.Helens (IEV 5), Krakatoa (IEV 6) and Tambora (IEV 7), Rampino assessed the temperature drop caused by Toba at 5 ° C. .
On the scale of global climate, a drop of 5 ° C is a global winter. High latitudes (50-70 °) this is a cool 15 ° C during the summer months: Europe supporting 30 ° C as 40 ° C in summer would fall snow in July, there would be a volcanic winter. Effects on agriculture, the growth of plants and ocean life would be catastrophic. This winter time when England, Scandinavia and Canada will experience a polar climate is expected to continue for years with a fatal blow to many living beings, animals and plants. But what would be the impact on humans? The answer is unfortunately not in the rocks. We can get an idea if we go back to the time when Neanderthal man had to face the coldest 75,000 years ago, during the Würm glaciation that lasted more than 20,000 years. But these are indirect evidence (rock shelters, animal skins and some other utensils coarse). Having learned that ecological disruption, two professors specializing in human genetics at the University of Utah, Lynn Jorde, a geneticist at the School of Medicine and Henry Harpending, an anthropologist, has linked this event to the issue of genetic evolution Mitochondria , one of the oldest organizations today and fully integrated human biology. By analyzing the mutation rate of mitochondrial DNA in ages, Harpending and Jorde noticed a strange phenomenon emerged from their results. It is expected to observe a relatively constant population size, with local peaks of growth and periods of stagnation or even decline, including mixtures of population. But they observed that the human population had decreased to frankly some time. This observation confirmed that other geneticists thought already. It has long wondered why humanity today presented a genetic variant containing so little when he was so rich to begin with? Phenomenon which might well have been the cause of this trend down? There is indeed all human societies today, whether they live in Africa, Europe, Asia and America have virtually the same genetic heritage so that within a hundred thousand years we should get genetic diversity is much more abundant genetic combinations. What could be the cause? The answer is that there was a dramatic decrease in population somewhere in the past. Scientists event there are less than 100,000 years: a bottleneck occurred for reasons that remain to be discovered. The human DNA is so similar across populations today that scientists have concluded that there was certainly a catastrophic reduction in population in the past. How imagine it? Harpending take the example of the current population is about 6 billion people. The event happened corresponds to almost total extinction where only a few thousand survived. In fact our species was on the verge of extinction. But a corollary it speaks also to our evolution. In an extraordinary diversity prior to the eruption, our ancestors would have gone through a bottleneck which would explain the poverty of our genetic heritage today and fragility. Concretely, this means that we all descend from the same family. According to Lynn Jorde, mitochondrial mutations are carried out with great regularity and the number of mutations can serve as a genetic clock to date the major events. In the case of our throttling Harpending and Jorde felt that occurred here 70 or 80 thousand years. Remains to be seen how this event has caused major mortality which left on Earth that 5 or 10 thousand survivors? Until now, geneticists had no idea what could have caused this accident. Henry Harpending began a lecture series in American universities to discuss this « bottleneck ». It was on this occasion he was invited by prof. Stanley Ambrose, a paleoanthropologist at the University of Illinois to give a lecture to his students. As we have said, the research team went on the assumption that the strangulation occurred between 70 and 80 thousand years, although this date is still widely debated. The super volcano Toba erupted 74,000 years here, right in the middle of this period. The super-eruption of Toba would have led to the extinction of most human beings. Remember that at this time the man had already conquered most of submerged lands in Africa, Europe, America and Asia, and this year 500,000 people were already several million people. Before the explosion is believed that hundreds of species of hominids branched and more or less affiliated lived on Earth. After the explosion a single species would have survived, which led to Homo sapiens. If the two events are connected vraiments, this has implications on the future terrifying eruption of Yellowstone. Its eruption could be of the same magnitude as that of Toba and have a devastating effect, not only on the surrounding region, but all over the Earth. Michael Rampino, the Yellowstone super eruption was between 1000 and 2500 times more powerful than Mount St. Helens, a power that Yellowstone has implemented in the past. Imagine over 1000 volcanoes like Pinatubo or St.Helens erupted simultaneously entering … The explosion release into the atmosphere between 1000 and 2500 km3 of ash and volcanic material. Incandescent magma blocks of several cubic meters fall on the ground at supersonic speed. In a few minutes hundreds of thousands if not millions of people will die in the United States instantly incinerated, pulverized. Large fertile plains are covered with ash. If this happens in winter ashes mingle with the snow to form streams of mud, even more devastating lahars because of their high density and their higher inertia. In a few days the ash cloud will reach the Gulf of Mexico. The transport of the blast in the upper atmosphere billions of billions of tons of ash, dust and sulfur dioxide which gradually darken the sunlight. 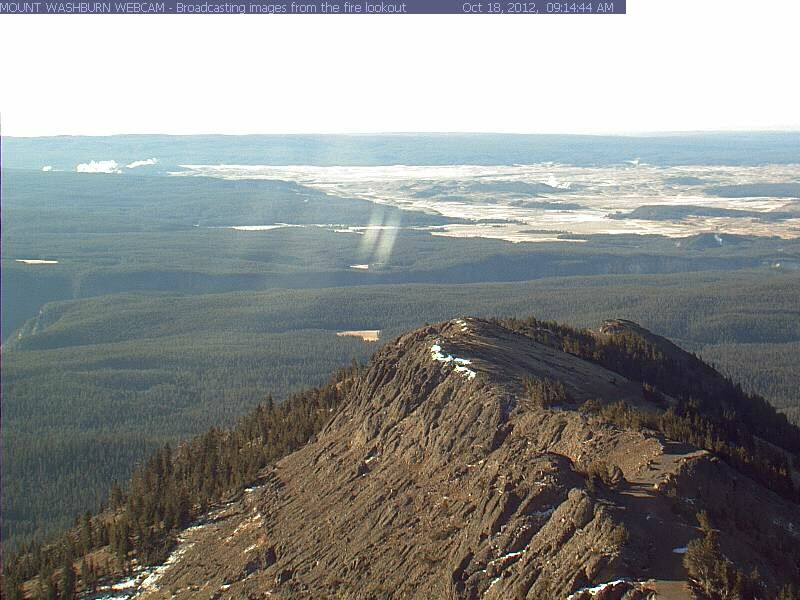 Extension of the two previous eruptions of Yellowstone. 2/3 of the United State are affected. This could he reproduce? Scientists think. Prepared by Dan Brennan and Mary Diman / UW-Madison News Graphics, translated and adapted by the author. All rights reserved. The climate will be altered on a global scale in the space of a few months. 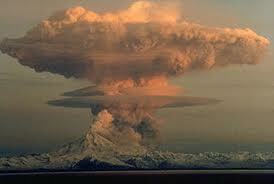 We will undergo continuous volcanic winter will last several years. Crops will be destroyed for several seasons even for several years, and especially wheat reserves of the United States who are now the breadbasket of the entire planet. The economic crisis is catastrophic and it will probably a generation or two to see life reborn, half a century during which deprivation of life will be extremely painful for everyone! The pessimists predict that this event will be fatal for humanity because there will be no resources available with all the excesses that this social cause. If this theory seems to be confirmed by the events of the past, some scientists oppose this conclusion deemed too Ardie. For our survival, hope they are right. If this theory is correct, and it seems subsequently confirmed by several separate events, we can better understand why scientists had cold sweats when they learned that was not only a Yellowstone super volcano, but he was ready to wake up … A story that could lead to the 6th extinction, that of humanity … and a very high percentage of other forms of life on Earth. Given the state of the planet after the disaster, it might be better if we disappeared in the eruption, because I’d rather keep the memory of green grass and blue sky punctuated here and there, cumulus beautiful time rather than see dry grass, dead trees gnawed by sulfuric acid, a gray sky out of sight and have to live the rest of my life in the cold and artificial lights! … But let us hope, the earth has already experienced such disasters and man has always maintained its survival instinct. Also, as Defender of the Earth, I propose ways to ensure a minimum of people can continue the extraordinary adventure of Humanity … on Earth or in outer space! all life forms who share our beautiful blue planet … Earth … Gaia!